List of all Nicotine Anonymous meetings worldwide. FREE!! The Meeting Starter Kit is a guide for anyone who wants to start a new Nicotine Anonymous meeting. It contains: suggestions for finding meeting places, outreach ideas and a sample flyer, guidelines for group service positions, sample meeting formats, and program texts and materials used during a meeting. SevenMinutes is our quarterly newsletter with experience, strength, and hope contributed by members about what has worked for them, tips to help with cravings, the impact of the Steps in their recovery. The newsletter also contains reports from NAWS board members and our annual conferences, along with other news about the Fellowship such as retreats and events organized by Intergroups. A great way to keep connected with your other members and the Fellowship as a whole. SevenMinutes is our quarterly newsletter with experience, strength, and hope contributed by members about what has worked for them, tips to help with cravings, the impact of the Steps in their recovery. 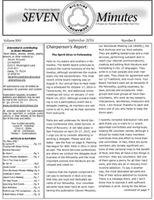 The newsletter also contains reports from NAWS board members and our annual conferences, along with other news about the Fellowship such as retreats and events organized by Intergroups. A great way to keep connected with your other members and the Fellowship as a whole. SevenMinutes is our quarterly newsletter with experience, strength, and hope contributed by members about what has worked for them, tips to help with cravings, the impact of the Steps in their recovery. The newsletter also contains reports from NAWS board members and our annual conferences, along with other news about the Fellowship such as retreats and events organized by Intergroups. A great way to keep connected with your other members and the Fellowship as a whole. SevenMinutes is our quarterly newsletter with experience, strength, and hope contributed by members about what has worked for them, tips to help with cravings, the impact of the Steps in their recovery. The newsletter also contains reports from NAWS board members and our annual conferences, along with other news about the Fellowship such as retreats and events organized by Intergroups. A great way to keep connected with your other members and the Fellowship as a whole. SevenMinutes is our quarterly newsletter with experience, strength, and hope contributed by members about what has worked for them, tips to help with cravings, the impact of the Steps in their recovery. The newsletter also contains reports from NAWS board members and our annual conferences, along with other news about the Fellowship such as retreats and events organized by Intergroups. A great way to keep connected with your other members and the Fellowship as a whole.. SevenMinutes is our quarterly newsletter with experience, strength, and hope contributed by members about what has worked for them, tips to help with cravings, the impact of the Steps in their recovery. The newsletter also contains reports from NAWS board members and our annual conferences, along with other news about the Fellowship such as retreats and events organized by Intergroups. A great way to keep connected with your other members and the Fellowship as a whole.